If you have curly hair, you know how it can be almost impossible to style. Use the wrong styling tool and you’re sometimes left with difficult to manage frizz. That’s why finding the best diffuser for curly hair is so important. We researched some of the best-rated and top-selling products on the market to bring you this hair diffuser review. Before we jump right in, let’s take a look at some of the key features you need to consider when shopping. Universal: Will this fit your hair dryer? Having a universal fit means the diffuser will fit most hair dryers with a nozzle design opening. Check this stat to make sure it will fit your hair dryer. 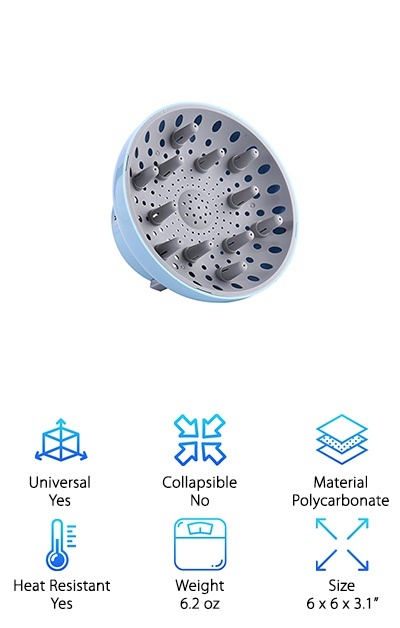 Collapsible: If you’re looking for something small, compact, and convenient for travel, you might want to consider a diffuser that collapses. Some of them get really small and are perfect to tuck in your purse or toiletries bag. Material: There’s a nice range when it comes to materials. Some are made of silicone while others are made of hard, resilient plastic. Plastic ones are usually more solid while silicone ones are capable of collapsing a little smaller. Heat Resistant: All of these are heat resistant to an extent. After all, they are going to be attached to a hair dryer that puts out some heat. But not all of them can handle high temperatures. Details in each review. Weight: Weights range quite a bit, from nearly about 12 oz to less than 1 oz! This doesn’t directly affect performance, but you’re going to attach it to your hair dryer to use it. Make sure it’s light and comfortable. Size: Generally, the larger the cup, the more hair it will hold. This usually means it will work a little faster and is great for thick hair. Also, make sure it’s compatible with your hair dryer’s nozzle! Now that you know a little more about the important features of hair diffusers we can get into our reviews. Running short on time? Make sure to check out our top pick and budget pick first. They’re easy to find - they’re the first 2 items on our list! Then stick around if you can and keep reading to learn more about the other great products we found to round out our top ten list. Ready? Let’s get right to it. One of the reasons this Hairizone is our pick for best hair diffuser for curly hair is how large the bowl is. At 6 inches in diameter, this one effectively spreads the air throughout large pieces of hair. What does that mean for you? Faster drying times and less frizz. Add in the fingers to lift, separate, and add volume at the roots and you’ll get your hair dry in 40% of the time. While some diffusers are only compatible with certain brands or styles of hair dryer, this one has a cool adjustable lock feature. Get this: it actually fits about 90% of the hairdryers on the market and can fit nozzles from 1.7 to 2.6 inches. There’s also a silicone strip along the inside of the diffuser so it won’t scratch your hair dryer’s barrel. 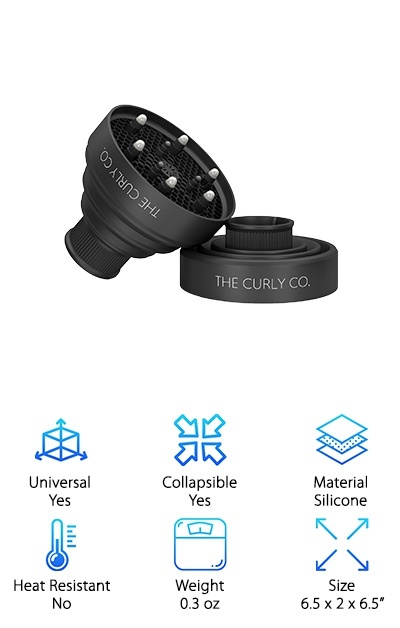 Our budget curly hair diffuser is from The Curly Co. What makes this diffuser so special is that practically the entire surface is covered with holes allowing air to flow through its honeycomb-like design. This diffuser is made of silicone. It’s super easy to attach to your hair drying. In fact, it was made to stretch and shrink to fit just about any hair dryer on the market. It also collapses down to only about 2.5 inches high so it’s easy to tuck in a drawer or even your toiletry bag for traveling. This diffuser is not heat resistant but that doesn’t make it any less effective! Diffusers should be used on low or even no heat to get the best results anyway! 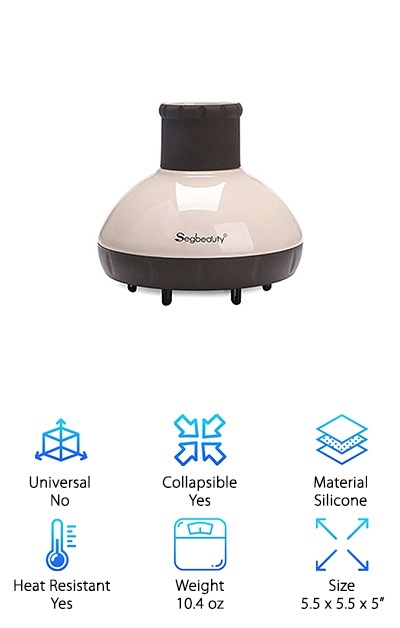 The thing that stands out about this Segbeauty diffuser is its cool ionic nano titanium technology. How does it work? The ions help break down the water molecules faster. The 114 air outlets and multiple long fingers help move air through your hairs. This helps it dry evenly and seals the hair cuticle which reduced frizz. Use the fingers at the root to get even more volume. One thing that we really liked was how easy it was to adjust the airflow. All you have to do it turn the base of the diffuser! That’s not all. It’s made of high strength silicone that can stand up to heat without releasing any toxic chemicals. And you get a 100% risk-free satisfaction guarantee. When it comes to drying curly hair, using the best hair dryer with diffuser attachment is the best way to make sure you blow away the frizz. That’s why we picked this BestTrendy Hair Diffuser to the list. It’s professional grade and dries your curly hair evenly while protecting it from the damage that concentrated heat can cause. 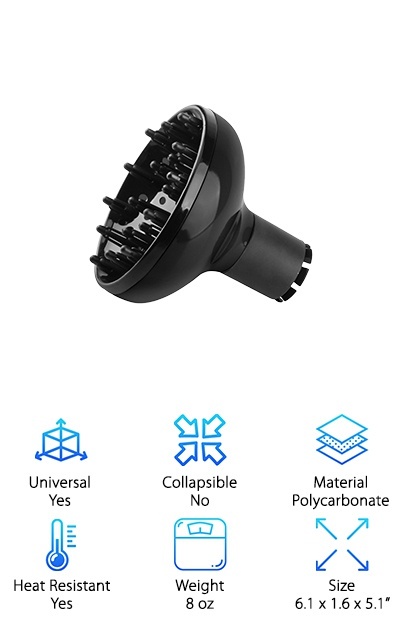 It fits most of the hair dryers on the market, too, with nozzles from 1.4 to 2.7 inches in diameter. All you have to do is place the nozzle inside then press the button to lock it. Don’t worry about damaging your hair dryer. The inside of the diffuser port is lined with silicone pads to give some cushioning and avoid scratching. Plus, it comes with a 1-year warranty. Our next pick for best hair diffuser is the BaBylissPRO. You can tell just by looking at it that it’s got something special. What exactly do we mean by that? The inside of the bowl is covered with bright blue titanium. Not only does it look really cool, it releases natural ions to help keep your curls in shape and get them dry without adding any frizz. The fingers lift the hair at the root so air can penetrate all the way through for quick drying. They’re longer than in some of the finger on other diffusers that work really well with long, thick hair. And get this: it’s a universal attachment that can fit almost any hair dryer. It’s really durable, too, and built to last. 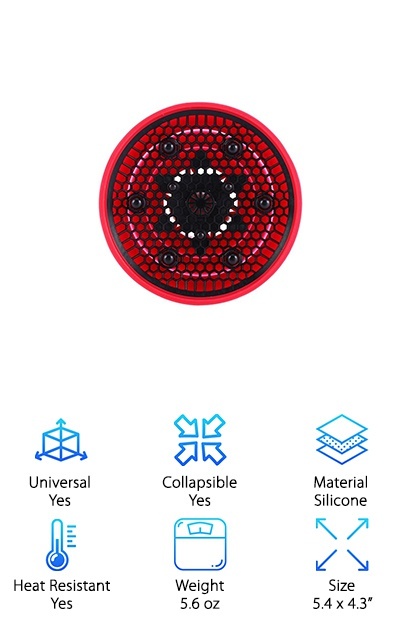 Here we have an awesome looking red silicone diffuser from Yosoo that has so many holes, we can’t even count them. The cup is shallow with a few short fingers to help work the air through your hair. It’s really wide at about 5.5 inches and because it allows so much air to flow through, it will get your hair dry fast without adding any frizz. This one is perfect for travel. It’s lightweight and collapses to be really compact. Plus, the bright red color means you can find it easily after you toss it into your suitcase. It’s a universal size and will fit most hair dryers, whether they’re travel sized, cordless, or professional grade. Combine it with the best hair dryer for curly hair and you’ll be blown away. 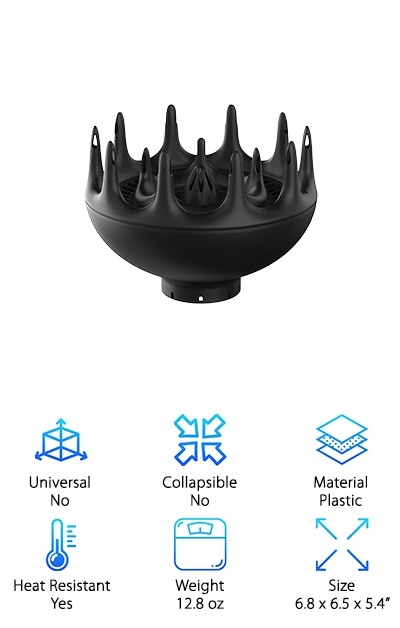 This diffuser has a honeycomb design that is almost completely open. That’s good because it allows air to flow freely through the cover. 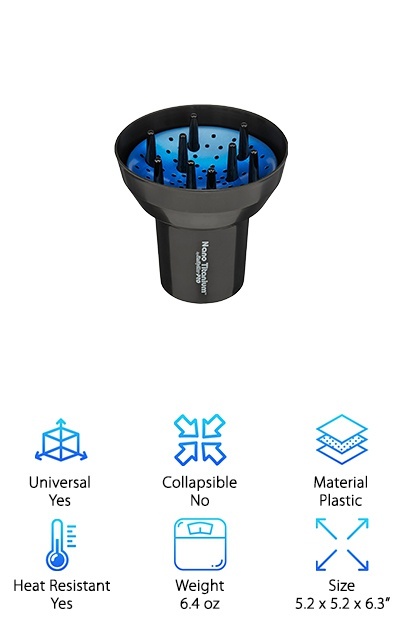 It’s actually a filter that can be removed from the diffuser for easy cleaning. One look at this product and you’ll see how unique it is. Why do we say that? 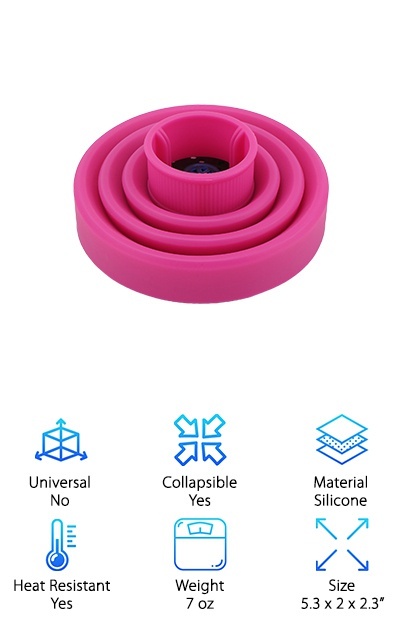 For starters, it’s made of bright pink silicone. It also collapses so it’s perfect for travel and because it’s such a bright color, you’ll always be able to find it in your travel bag. Another unique thing about this one it there’s a small reservoir where you can put a cotton ball soaked with essential oils that will get distributed throughout your hair as you dry it. And get this: it comes with a 30-day money back guarantee. The xtava Black Orchid diffuses curly hair gently and evenly so you get a lot of volume without a lot of frizz. Thick curly hair can take forever to dry, almost to the point that your arms start to hurt so much that you wonder whether or not it’s even worth it. This diffuser is pretty big and helps get your hair dry fast while keeping your curls smooth. One of the ways they manage to do this is by adding air holes to the fingers. This puts air right at your roots, drying your hair faster and adding lift. It also has a deep cup design that can hold a lot of air at once for faster drying. We just have to get this out of the way first. This diffuser is adorable. It almost looks retro thanks to the light blue, sparkly color and it performs really well, too. There are 211 air holes to help you dry your hair quickly while protecting it from harsh, concentrated heat, all while preventing frizz. 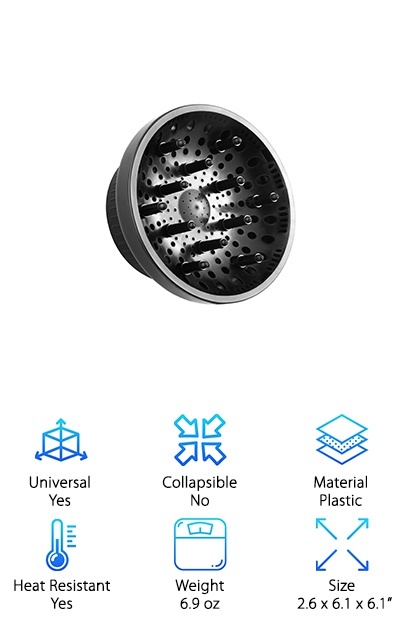 It’s truly universal, too, designed to fit most hair dryers with a 1.7 - 2.6-inch nozzle diameter. That’s roughly 90% of all hair dryers on the market so it’s likely you’ll be able to find the perfect hair dryer and diffuser combo with this one. It has a retractable that acts as an adjustable clamp to get a secure fit. The bowl is 6 inches wide and holds a lot of hair. 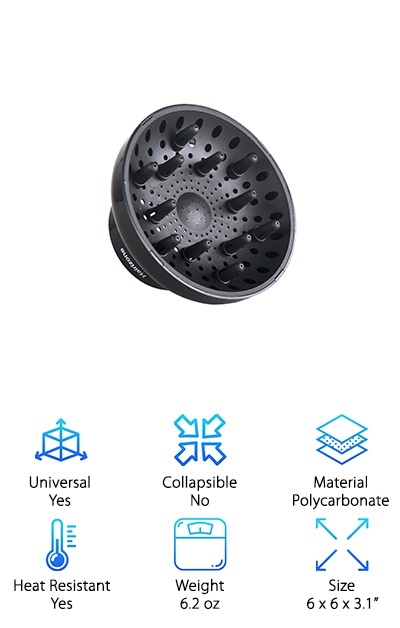 This NaCot Universal Diffuser can fit hair dryers with a nozzle diameter of 1.7 -1.9 inches. The bowl is 6 inches wide and pretty deep. It can hold a lot of hair. Plus, the multiple long fingers help separate your hair. Air penetrates easily to get the job done in less time. Not only that but they can massage your roots to give you extra lift and body. Think about it: you get evenly distributed heat that helps break down the water molecules in your hair faster. What does that mean? A smoother, more natural curl. NaCot really stands behind this product, too. They offer a 100% risk-free satisfaction guarantee. If you don’t immediately love it, they’ll give you your money back in the first 30 days, no hassle.